We arrived in Myanmar from Singapore late on a Tuesday night, tired after a days travel and sitting around at the airport. We’d been told last minute that we needed to pay for our tours in Myanmar in USD cash and not card – this meant an expensive cash withdrawal and currency change, with the Halifax charging £30 for withdrawing the money, plus poor exchange rate and fees, also couldn’t exchange for Burmese Kyats so would be arriving without any local currency. After the relative luxury of Chang Airport in Singapore, Yangon International Airport was somewhat dated but clean. Immigration was efficient, although our bags took a while. We cleared customs without any hassle and found loads of modern ATM machines, withdrawing Ks.150,000 for £91 – enough for most of our trip we hoped. We were met by our driver, glad in the traditional Longyi – a type of sarong – at the front door and made our way through the downtown traffic. Anyone picturing Yangon (or Mandalay) as a picturesque colonial town best think again, these are sprawling cities with several million inhabitants and the associated trash of the streets, traffic jams and heavy dust and pollution in the air. Our driver spoke a little English and pointed out sights as we negotiated our way into the city centre. Dozens of impressive golden pagodas peaked out from behind buildings and trees – the gold shimmering in the street and car headlights. Finding our hotel at night proved a challenge for the driver as he battled his way through the one way street system, past dogs sleeping in the road and people eating their dinner at street stalls. After a frustrating twenty minutes of going round in square circles, we found our hotel, The Beautyland II Hotel. I have no idea what happened to the Beautyland I but I can only hope it was condemned and demolished thirty years ago, if it’s successor is anything to go by. After seven weeks of travelling we’ve stayed in some shitholes – but this took the biscuit. Whilst we’d booked it as three star hotel, and reviews on sites such as Hotels.com say three stars, above the desk they ironically display their 1 star status. The room was horrendous and the wifi almost on-existent, so the less time we had to spend the better and we headed straight out for a late night walk. We crossed a footbridge with dozens of teenagers injecting themselves with various drugs and wandered to one of the large golden pagodas we’d seen, which was located on a large round about adjacent to the main city square. With no real sense of orientation, no wifi to download info and an early start, we reluctantly returned to our hotel and hoped for a decent night sleep. We awoke to the regular banging of repair works and creaking as the outdated plumbing system fired up, ate a basic breakfast and met our guide for the day. 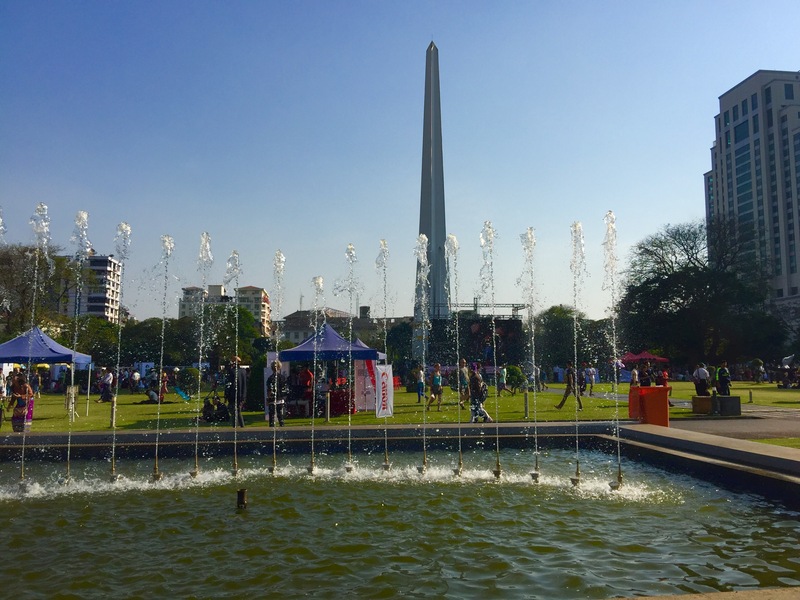 We headed back to the main square and the large monument, commemorating independence from Britain in 1948 – although independence was granted in 1947, the assassination of Gen Ang San meant the formal date was delayed. Next we stopped in at the main Post Office which still had counters for telegrams and faxes, as well as some museum pieces from years gone. 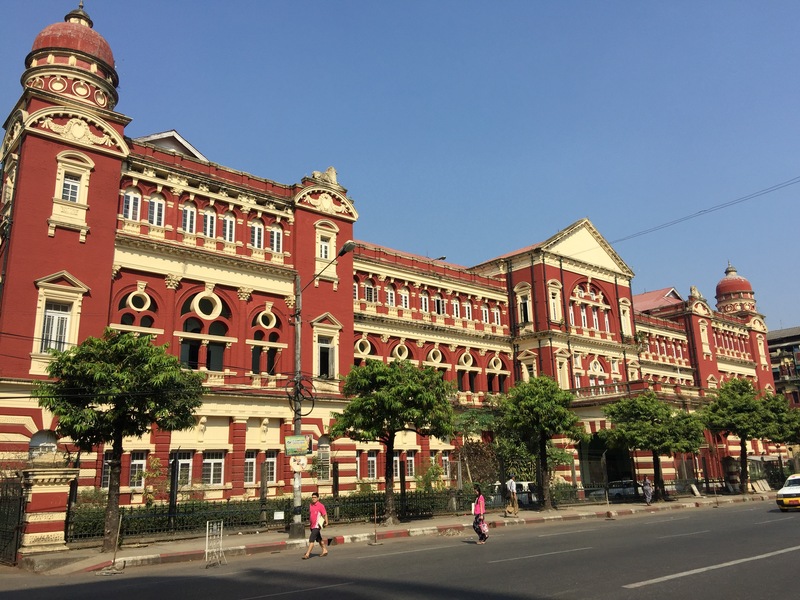 Opposite is the beautiful old colonial Court House which is now undergoing renovation and hosts only occasional museum exhibitions and open days – the main Court having now moved from Yangon to the new political capital of Myanmar Naypyidaw. We continued to wander down the streets past grand old colonial buildings that have fallen into a state of total disrepair, many suffering bomb damaged from the Second World War. By the riverfront, we passed the luxury The Strand Hotel, built in 1901 and acquired by the Sarkies brothers who owned Raffles – it remains one of Asia’s most iconic five star hotels. After a morning on our feet in 36c heat we stopped at the Lucky Seven restaurant for lunch. Popular with tourists and locals, it offered a good selection of local dishes, giving us a chance to try fish soup and a chicken broth with feet floating in it. The restaurant is owned by a local entrepreneur and staffed by homeless and poor boys aged 12-15 – after lunch service the businessman pays for all the boys to go to a special school. 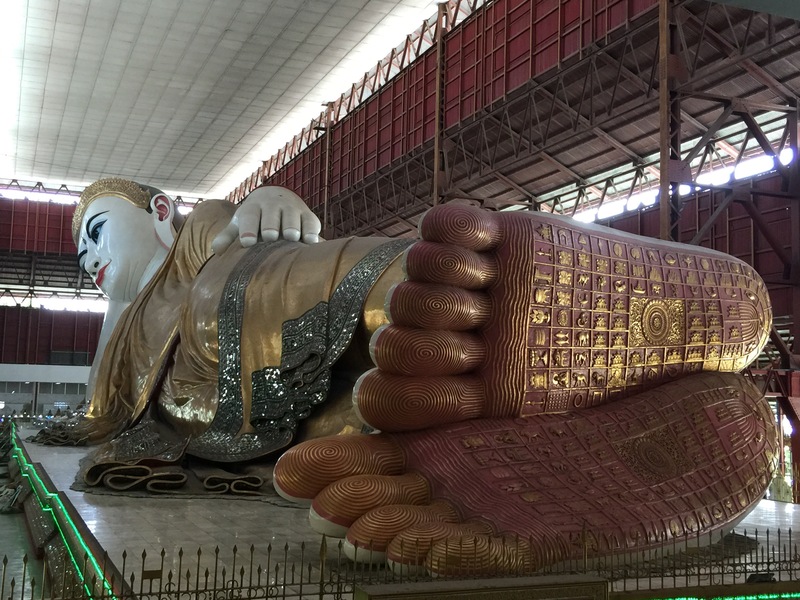 Our afternoon drive took us to a giant reclining Buddha with impressively large feet – lined with smaller figures depicting various religious poses. Alongside the statue, next to one of the dozens of donation boxes (religion is clearly a very profitable business) was a golden stone – if you donated money and were able to lift the gold painted rock your wish would come true, if you couldn’t lift it, it wouldn’t. Luckily the shiny golden rock weighed about 3kg…so presumably everyone’s wishes come true – and all for just K1,000 (70p). 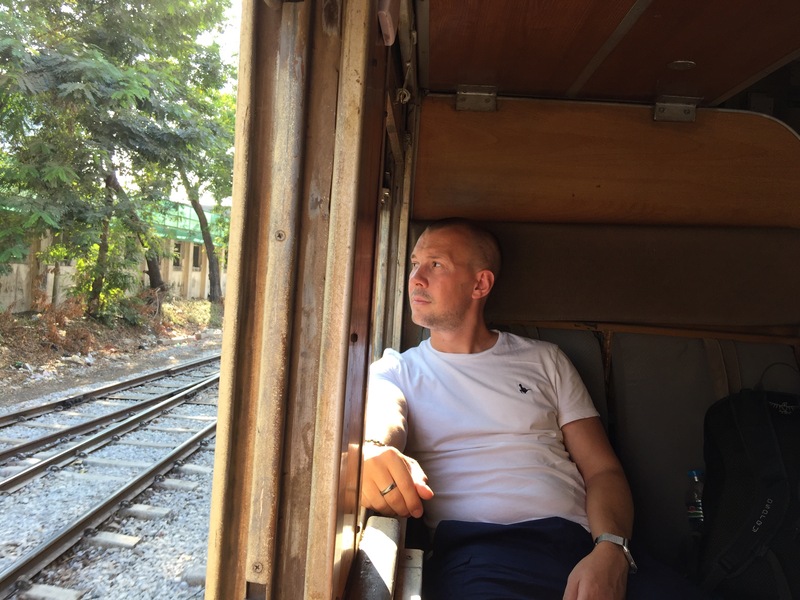 After a busy day in Yangon we headed to the main train station for our 4.30pm train to Bagan. We located our platform and waited for our train – conscious that trains often change platform with little or no notice. But our luck was in, our train rolled in only 15mins late and our car was alongside where we were stood – more good luck than good judgement. This was our seventh sleeper train on our travels so far but at 19hrs by far our longest. Another first was that the carriage had windows which opened, unlike info where we viewed the countryside through dirty brown glass. We were sharing a four seat/ bunk carriage with an American and a Hong Kong traveller, although conversation was sparse. As we rolled out of Yangon we watched the bustling city transform into suburbs and slums and finally countryside. The sun setting in the distance as local children waved at us and the cool evening air flooded into the carriage. But as quickly as sunset came, it was gone, day was replaced by night and suddenly the open windows provided an entrance for a million bugs. With the carriage now crawling with bugs of every shape and size, windows were slammed shut and lights went out – que bedtime – although bedtime didn’t mean sleep. The incredibly uncomfortable fold down beds and the rapid drop in temperature with only a thin sheet, meant we had a 3am scramble for trousers, jackets and socks. Our full day in Bagan would be interesting after only 2hrs sleep!